This 131-piece variety pack combines several popular craft items together in one package. 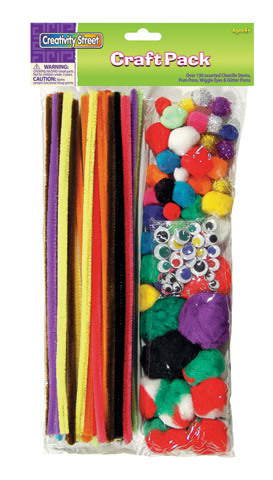 It contains 50 12" 9mm chenille stems, ten 15mm wiggle eyes, 20 10mm wiggle eyes, six .5" glitter poms, ten .5" poms, 15 .75" poms, ten 1" pom pons, six 1.5" pom pons and four 2" pom pons. Intended for ages 4 years and up.